Struggling to educate your channel partners or influence decision-making in potential clients? In today’s go-go business landscape, this a problem most vendors endure. But what if I told you there was a cost-effective, highly lucrative and richly reward strategy for eradicating this common B2B Channel Partner Marketing. 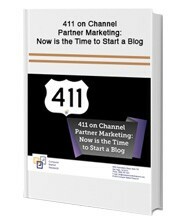 Download a Free white-paper on “411 on Channel Partner Marketing: Now is the Time to Start a Blog” by filling out the form on the right and find out how.